If you want to beat the summer heat, explore the Texas Hill Country underground caves – the temperature is always around 70 degrees! Llano is a great place to stay for your spelunking getaway. The Mustard Seed Bed and Breakfast on the Llano is just over half an hour from Longhorn Cavern State Park, with great caving adventures for novices and experienced spelunkers alike. If you’re looking for more caving experiences, Colorado Bend State Park is just 45 minutes from Llano. There, the caves have been left in their wild, natural state. 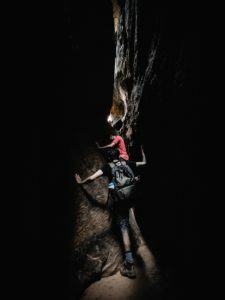 This park offers a variety of guided tours with different levels of physical challenges, from just stooping to tours limited only to experienced cavers. When it’s time to leave the caverns behind, come back to Llano to enjoy Badu Park’s swimming, fishing, nature and biking trails, plus Llano’s restaurants, wine bar, coffee bar, and shopping. Inks Lake State Park with its swimming, boating, fishing, and hiking is nearby as well. Longhorn Cavern State Park, on Park Road 4 South in Burnet, is a day-use only park, open from 9:00 am – 6:00 pm daily. Access to the grounds, including hiking trails, picnic area, and historic CCC buildings, is free. Cave access is by guided tour only. In addition to touring the Cavern, visitors can climb the observation tower for a spectacular view of the Texas Hill Country, enjoy hiking trails, and view the unique architectural style of Parkitecture buildings, intended to harmonize with the natural environment. Visitors to the park can learn about the history and geology of Longhorn Cavern on the guided walking tour of the cavern’s cool rooms and passages. The Cavern took millions of years to form. First, the limestone that forms the Balcones Ridge was deposited on the bottom of what was a shallow tropical sea about 500 million years ago. The Llano Uplift, 200 million years later, created cracks in the limestone through which water flowed, dissolving limestone to form caves like Longhorn Cavern. The large space near the cave entrance was used for shelter as early as prehistoric times. It was not until the 1930s, however, CCC workers removed tons of mud and debris, to make much more of the cavern became accessible. The Cavern Walking Tour, a mile-long 90 minute adventure, introduces visitors to the most easily accessible portions of the cave. Wearing low-heeled shoes with rubber soles is recommended. Some of the spaces the Walking Tour highlights include the Underground Ballroom, Moon Room, Indian Council Room, Hall of Diamonds, Hall of Marble, Gallery of Formations, and Crystal City. Tour Schedule: Weekdays, weekends, holidays: On the hour from 10 am to 4 pm. Fees: Adults $17.50, Seniors (65+) and Military with ID $16.50, children ages 3-12 years $12.75, infants free Tickets may only be purchased at the park visitor center, and tours are available on a first come first served basis. At Colorado Bend State Park, over 400 caves have been left with floors are dirt and rock, and no artificial lighting has been installed. The park offers a wide variety of guided Wild Cave Tours, depending on visitors’ previous caving experience. Their introductory Discovery Tour to the Dynamite Cave requires stooping and bending, but no crawling, while the intermediate difficulty Adventure Tour requires crawling, sliding, and climbing through small spaces. Climbers Tours are recommended only for experienced cavers. Visit the Wild Cave Tours’ website for detailed information about the schedule, requirements, and costs of different tours. Colorado Bend State Park also offers over 35 miles of trails open to hikers and mountain bikers. The Trail Map indicates points of interest and trails of varying difficulty. Three of the most popular trails are the easy River Trail, the Spicewood Springs Trail leading to spring-fed swimming holes, and the more challenging Gorham Falls Trail. Visitors to the park also can enjoy swimming in the slow-moving Colorado River, fishing for bass, and kayaking (rentals available) or boating. Fees: The day-use fee for the park is $5.00 for adults; children ages 13 and under free. Wild Cave Tours are an additional cost. When it’s time to return to Llano, you’ll welcome the amenities our bed and breakfast offers: a king bed with luxurious bedding, a well-equipped kitchenette stocked for breakfast each day, patio or screened porch, and an outdoor area with a hot tub. Downtown Llano is just one block away. Each of our three guest rooms is unique, so be sure to view them all before you choose your favorite! This entry was posted in Attractions, Texas State Parks, Uncategorized and tagged caving, Colorado Bend State Park, Inks Lake State Park, Llano B&B, Longhorn Cavern State Park, speelunking, Summer Activities by admin. Bookmark the permalink.